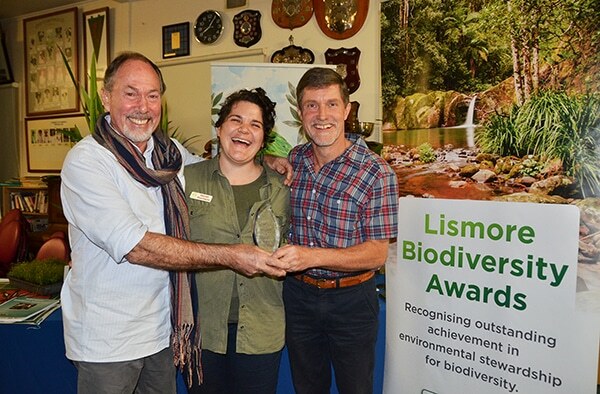 The inaugural Lismore Biodiversity Awards were held in August 2017 to recognise people working to protect and enhance our environment. The biennial awards are part of the Biodiversity Management Strategy and a commitment from Council to thank people in the community who are acting to improve our environment. The awards recognise exceptional community groups, schools and rural landholders, with an emphasis on those who are improving biodiversity values that support healthy habitats and native wildlife. 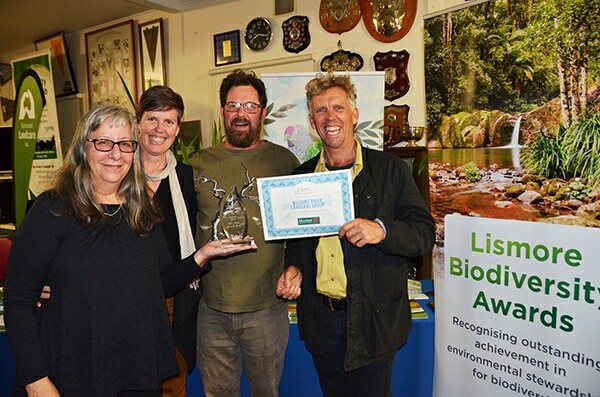 Each of the winners received $1000 in cash or goods and services, as well as the honour of being named winners of the very first Lismore Biodiversity Awards. “Our winners showed great passion for the environment, and an enduring love for the land that is demonstrated in the legacy they are creating,” Council’s Environmental Strategies Officer Vanessa Tallon said. “Our inaugural winners were people who have strived for decades to improve the local environment, and you can see the results of that hard labour in the forests, parks and rainforest remnants they have planted and nurtured, which are full of diverse local species and home to many native animals. It’s quite unbelievable what they have achieved. Nominations for the next awards will open in April 2019 with a gala awards ceremony in August. For primary producers demonstrating best practice managing biodiversity alongside agricultural production. Robert Hunter from Corndale owns a 40-hectare cattle property at Corndale. Over many years he has undertaken a series of fish habitat rehabilitation projects along 2.2km of Coopers Creek. His works have included stock fencing and planting more than 4500 native species to improve water quality and habitat for local fish and other native animals. 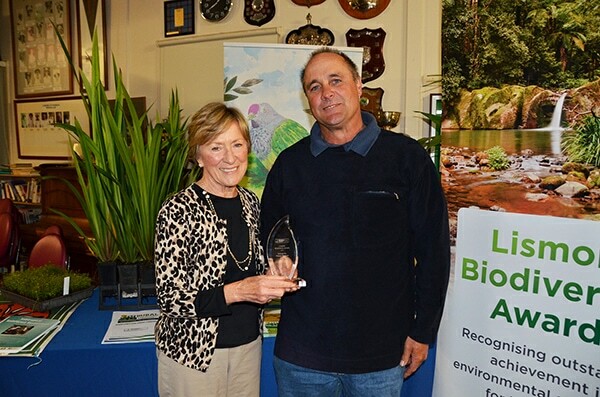 Image right: Winner of the Soilcare Inc Primary Producer Award Robert Hunter with sponsor Bonnie Walker from Soilcare Inc.
For rural lifestyle landholders demonstrating outstanding biodiversity work. Ken Williams and Adrian George own a 40-hectare rural lifestyle block at Georgica that they have painstakingly turned from degraded habitat into a flourishing rainforest over the last 25 years. The pair have worked tirelessly to restore native vegetation and koala habitat as well as degraded creekbanks, doing everything from the weed removal and the seed propagation to planting more than 7000 native species by hand. Image right: Winner of the Individual Rural Landholder Award Ken Williams (right) and Adrian George with sponsor Hannah Rice-Hayes from Richmond Landcare Inc.
A community group or school doing excellent biodiversity restoration or species protection work. 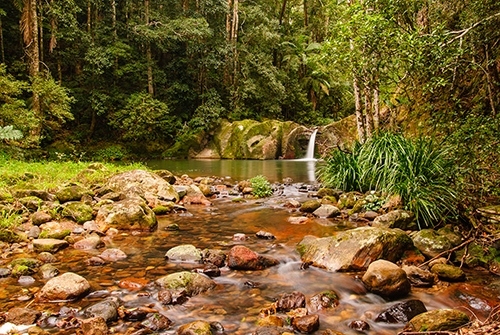 The Wilsons River Landcare Group has been committed to restoring lowland subtropical rainforest in the floodplain and endangered ecological communities for more than 20 years. The group has often worked in high-profile areas throughout the CBD such as Pritchard Park and along the Wilsons River to improve the urban environment. They have also inspired countless other Landcare groups through National Tree Day and other education events. Image right: Community Group or School Award sponsor Mark Dunphy from Fire-wheel Rainforest Nursery (far right) with members of the winning Wilsons River Landcare Group (l-r) Woo Wei Richards, Kristin den Exter and Dave Dreher. Special thanks to our very generous sponsors SoilCare Inc., Richmond Landcare Inc. and Fire-wheel Nursery.